Rachel took this picture on her telephone because I have mislaid my camera. We are enjoying coffee after the service in Paxton. It is a splendid building and the welcome was really warm! Up early and walked Mix. It really is a nasty day, cold and wet and not at all pleasant. We set off early because we were going to Hutton and Paxton today. I had consulted the Presbytery website and worked out that the service would be at Hutton so that was where we went. It was all closed up and there was a sign on the door with a full calendar of services. We learned that we should be at Paxton, so we drove along the road to Paxton and were still in excellent time for the service. Paxton is a beautiful little church and this morning it was well-filled with several visitors apart from ourselves. 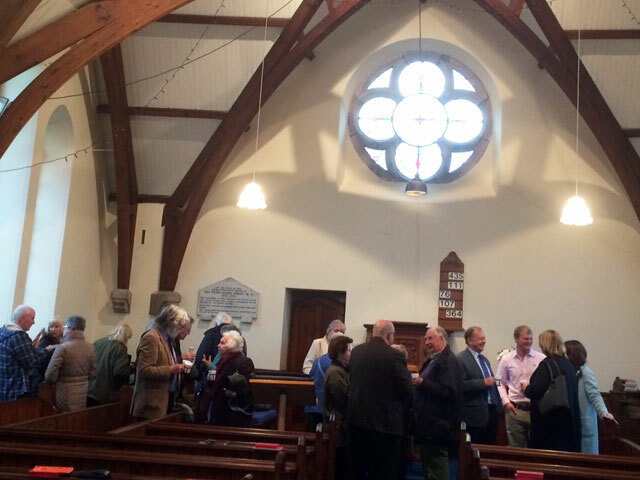 We felt extremely welcome and enjoyed the coffee and chat after the service. I also enjoyed the service, conducted by the Interim Moderator, Tom Nicholson, very much indeed. It was a happy, thoughtful service and as I drove home, having worshipped at services led by Norman and Tom in the last couple of weeks (apart from my own congregation) I thought how fortunate we are in this presbytery. Back home, we had lunch and then Rachel and I went into Berwick to visit HomeBase where there was a 15% discount on everything in the store. So I bought the parasol I need for the garden furniture I bought in the end of season sale last year, and some paint for upstairs in the Hen House. We got home just in time for Rachel to have a cup of tea before it was time for her to set off for Berwick once more to attend Evensong. On her return we watched the final Scottish leaders’ debate while we had a snack supper. The debate was a bad-tempered affair. We have heard them all too often and there is nothing new to say. I find myself getting so frustrated that so many of them believe that their job is not to answer questions. I also find it extremely frustrating that leaders refuse to accept the answers given by other leaders. Nicola Sturgeon couldn’t have been clearer about the fact that there is no question of another referendum on independence unless the situation changes significantly. Obviously she cannot rule out another referendum because something might change (the rest of the UK might vote to leave the European Union, for example) so the nonsense continues. It will be good once the election is over, it seems to have been going on forever. Mum and Olive came across to the Granary to watch Home Fires – a new Sunday evening drama series set during the second world war. A first episode is always a little bit introductory but it looks promising.